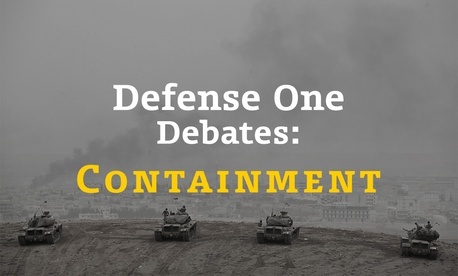 Editor’s Note: Everyone seems to be dancing around the “C” word these days: containment. Well, we at Defense One think it’s time for a blunt debate about that very concept. Here are four commentaries on why containment is (or is not) such a bad idea for ISIS, terrorism, or any foreign policy, for that matter, submitted by authors at the Center for a New American Security, CNA Corporation, Center for Strategic and International Studies and The Heritage Foundation. Secretary of State John Kerry has emphatically denied that the United States is pursuing a containment strategy against the Islamic State in Iraq and Syria, but the term appears apt. Containment hardly seems optimal, and ISIS does not yet seem contained, but at this point it is unclear that the administration is interested in or capable of more. Indeed, recent ISIS advances suggest that they are nowhere near contained. As messaging, Kerry’s denial is understandable. Announcing that the United States merely intends to “contain” ISIS would seem to suggest that we are content to treat it as an entity we can work with. 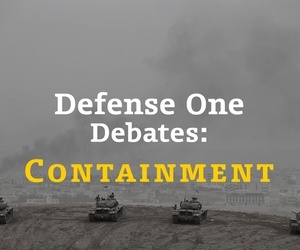 Politically, “contain” is much less impressive sounding than “destroy.” It also conjures up previous administration statements and critiques about pinpricks, red lines and unbelievably small uses of military force. We now see that the U.S. is trying to restore a semblance of stability to Iraq. A U.S.-led military coalition is attacking from the air ISIS’s march in Syria and rolling back their presence in Iraq by working with Syrian opposition groups, Kurds, the Iraqi government and even in parallel with Iran. A few years ago, it seemed that the tide of war was receding. The unfortunate part of the tide metaphor is that tides come back. Members of both political parties who previously advocated inaction in Syria should now recognize that this is what a strategic vacuum looks like. There may well have been a time three or four years ago when the United States could have intervened boldly and decisively in Syria, shaped events on the ground, prevented the rise of ISIS and even punished the butcher of Damascus. We didn’t. Just because we’ve now become aware that the train left the station doesn’t mean that we can call it back. There is no magic wand that the U.S. can wave to eliminate ISIS or fix Syria. 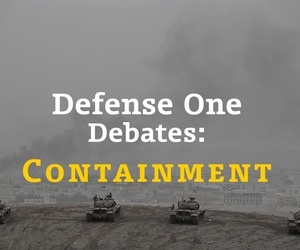 As bad as containment sounds, it may now be hard to accomplish more. Today’s situation is in part the result of past decisions, including the failure to conclude a SOFA with Iraq in 2010, formulate a policy towards Syria, and seize opportunities in the Arab Spring. Following the 2011 U.S. withdrawal in Iraq, Maliki’s government was intent on alienating Sunnis at grave expense to the country. As the Arab Spring waned and the U.S. declined to intervene, Syria fell apart. In August 2011, President Barack Obama said that Assad must go. Three years, red lines and over 150,000 deaths later, we are now engaged in limited airstrikes in both countries. The current de facto policy of containment appears to depend upon two faint hopes for capacity building. First, there is the hope that the U.S. will be able to keep ISIS at bay while the Iraqi government reconstitutes itself and a meaningful defense capability. Air power can buy time and create advantages while Kurds and the Iraqi forces hold their respective areas, but much will now depend on whether the new Iraqi government departs from the Maliki model. In the meantime, more could be done to arm and support the Kurds. Second, the administration hopes that arming and equipping moderate Syrian opposition factions will create a force inclined and able to counter ISIS (rather than, say, enter into a non-aggression pact) but also contain Assad to set the distant stage for future political resolution. So far, rebels on the ground have proved unable to advance against either, let alone pave the way to a political solution. The success of both is highly uncertain. There is no magic wand that the U.S. can wave to eliminate ISIS or fix Syria. Without ground troops, it is unlikely to be solved decisively. In the meantime, increased air strikes would be a welcome improvement. The consequences of past inaction will continue as things burn themselves out. That will be bloody, and may take a decade. The rise, containment and the slow and painful decline of ISIS is part of the cost of a failed Middle East policy, but it will not be the last. And no matter what happens with ISIS, it is just one piece of a larger, uncontained belt of extremism, terrorism and instability now extending across Algeria, Libya, Syria, Pakistan and beyond.